The next time you sidle up to the bar and order a PBR, you may be confused when the bartender asks you "which one?" Don't be. The budget-friendly dive bar mainstay is releasing two new options for your casual drinking pleasure, including one with a boozier 6.5% ABV and another that's non-alcoholic. 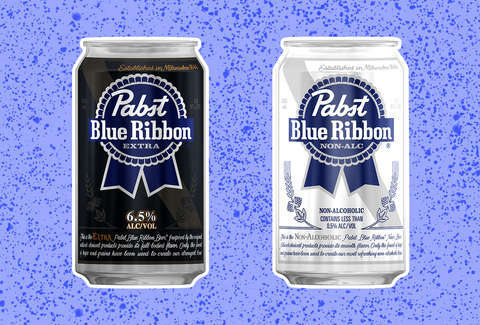 To celebrate its upcoming 175 anniversary later this year, Pabst Blue Ribbon announced this week that it's adding two new iterations of its beloved cheap beer: Pabst Blue Ribbon Extra and Pabst Blue Ribbon Non-Alcoholic. The former will be boozier than the original with a 6.5 ABV (a classic PBR has an ABV of 4.6%), while the latter will be, as its name suggests, practically booze-free (0.5% ABV). It's part of a slate of new releases the brewery has planned to mark its momentous birthday, including its first-ever whisky. Both offerings evidently started rolling into stores and bars in March, though you can see where they're available in your area at the moment using the brand's handy PBR Finder. Alternately, you could probably just pop in to any local watering hole popular among bearded hipsters and probably find what you're looking for.